A third place podium finish for Jazeman Jaafar topped off a solid weekend at the fifth round of the Formula 3 Euro Series in Nurburgring. 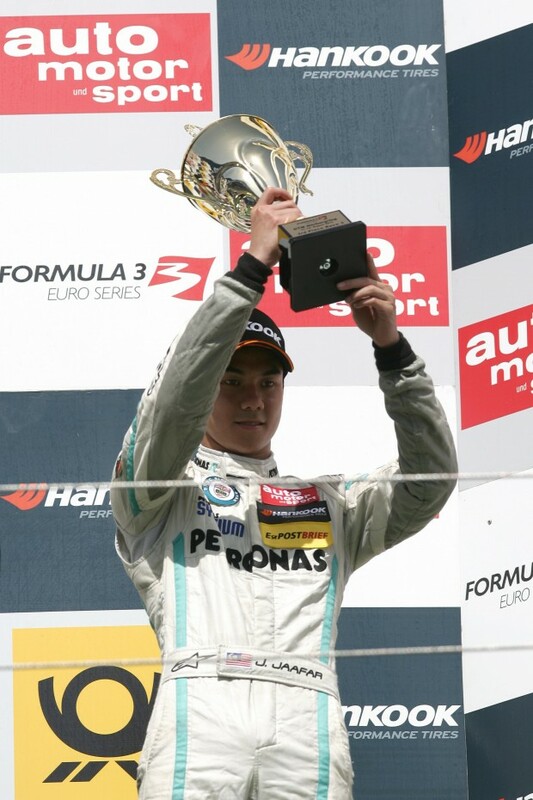 The young Malaysian, competing as an invitation driver, finished in fifth place in the first race and seventh in the second race as a prelude to his third place result. Jaafar travelled to Germany for the Nurburgring event to keep himself race fit in between rounds of British F3. With a five week gap from the previous British F3 round at Snetterton to the next event at Silverstone in September, the young Malaysian driver used the opportunity of the F3 Euro Series round to gain extra seat time in his F3 car and the chance to race with a different field of drivers. The PETRONAS Talent Programme driver was never out of the top ten in the practice sessions and took this momentum through to qualifying, putting in laps which put him in a sixth place grid slot for the first race and a fourth row start in ninth place for the third race. With bright sunshine and scorching heat, the first race on Saturday morning produced a rare processional race, with Jaafar one of the few drivers to improve on his grid position, making a move on the opening lap to claim fifth place. He held station over the course of the race distance, ably fending off F3 Euro Series front-runner, Raffaele Marciello to the chequered flag. Jaafar was the best-placed Carlin driver and the highest finisher among the Volkswagen-engined cars competing at Nurburgring. In the second race Jaafar started fourth on the grid, but he was unable to fend off a couple of Mercedes-powered cars, finishing in seventh position at the chequered flag, successfully keeping F3 Euro Series points leader Daniel Juncadella behind him over the whole race distance. The final race of the weekend proved to be far more action packed than the first two, with a number of clashes at the head of the grid keeping Jaafar on his toes, with the 19-year-old driver skilfully avoiding being caught up in any of the tangles and using his excellent race craft to manoeuvre himself into third place. With a train of cars behind him, all vying for a coveted podium place, Jaafar defended hard and ensured he was the victor in this battle. Jaafar returns to racing action in three weeks’ time, with the penultimate round of the British F3 International Series, which will be held at the home of the British Grand Prix, Silverstone circuit.